As with the recent surge of “craft keg” breweries TLDC has taken considerable inspiration from new wave producers in the USA. However, it is also taking guidance from the whisky establishment, calling on the huge experience of consultant Dr Jim Swan to help it hit the ground running and avoid some of the startup woes sometimes felt by Stateside compatriots. Unfortunately, there won’t be any TLDC whisky until at least 2016 as whisky requires three years in the wood to gain that designation under EU law and TLDC hasn’t distilled its first make as yet. 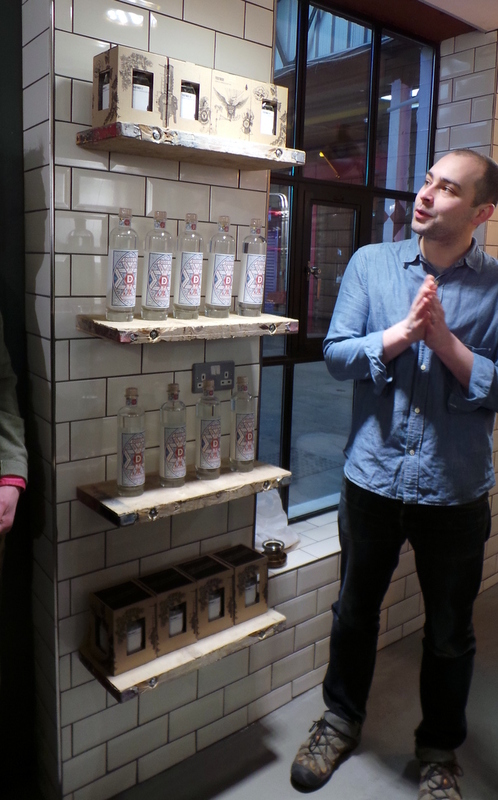 So with no whisky available to sample, the Squad was treated instead to a sample of TLDC’s first mainstream product, Dodd’s Gin, plus an extensive introduction to TLDC and its approach by Rook. 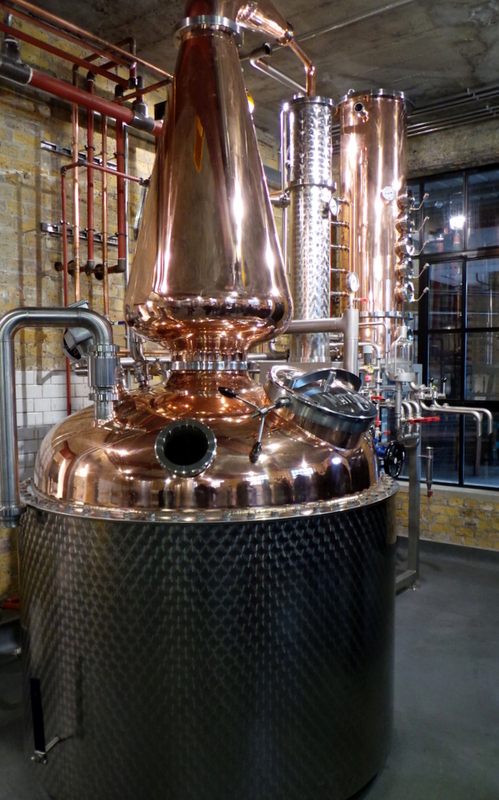 Named for 19th century entrepreneur Ralph Dodd who planned but failed to open his own London Distillery Co, Dodd’s Gin builds on TLDC’s earlier experiments in search of a perfect gin to make a negroni under the name Testbed1 (also the name of an arts and events space across the way from the distillery). 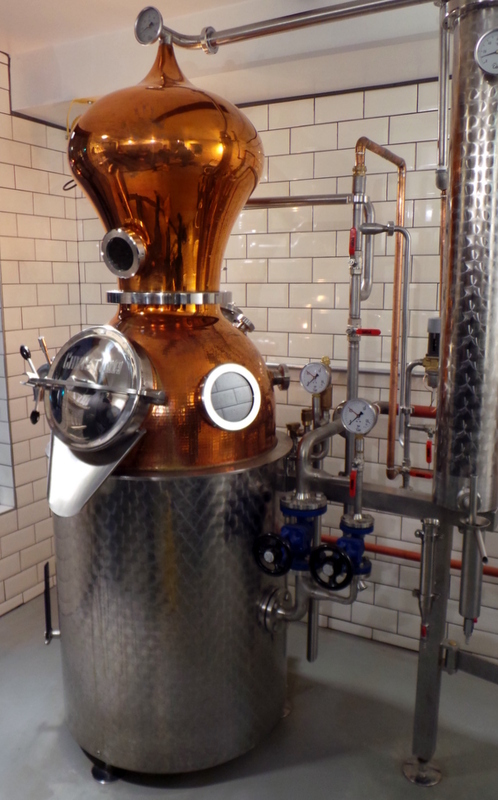 The new gin amply demonstrates TLDC’s devotion to juniper at a time when many other new gins are leaning towards more perfumy blends of botanicals. Bottled at 49.9% to help retain volatile oils, this helps it stand out from the crowd and certainly increases its appeal to yours truly (I’m not a big fan of overly flowery gins) as does its studied but playfully retro label and bottle design. With only nine bottles not spoken for on the day of our visit there was little chance of persuading Rook to part with one. 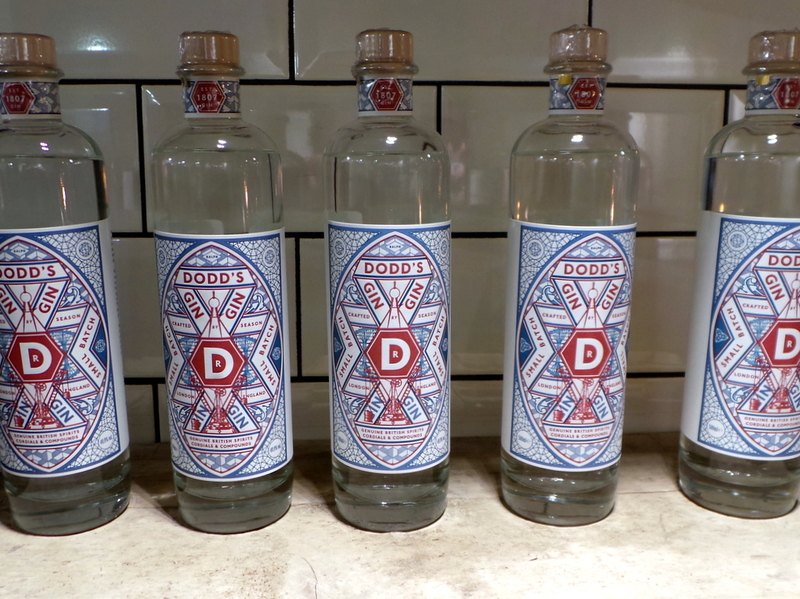 However, Dodd’s Gin is now available at upmarket retailer Fortnum & Mason so I could be tempted to pick up a bottle before long. But back to whisky. TLDC’s location in an old dairy has enabled it to create a compact but inviting space for a new distillery. However, it may also have other advantages. Rook is hopeful that the distillery will be able to isolate and culture its own unique yeast strain from dormant microorganisms still resident in the walls of the building. Whether such a yeast will be up to scratch for whisky production is yet to be seen. In the meantime the distillery is set to experiment with washes fermented using yeasts from London breweries past and present, including Fuller’s, Young’s, Truman’s and Whitbread. All of these should be able to take the resultant wash to around 8.5%, Rook reckoned. Certainly enough from which to make whisky. TLDC’s experimental urges don’t stop with yeast. 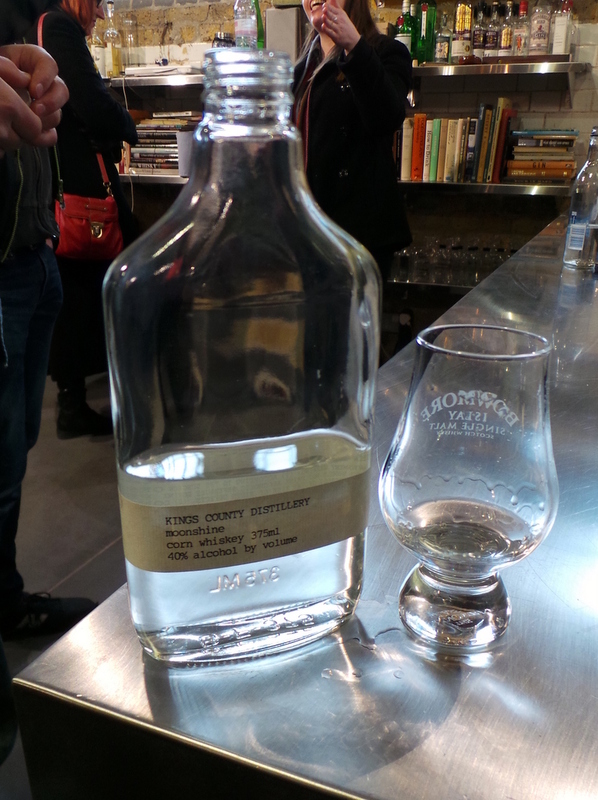 During the tour Rook mentioned absinthe, vodka, rye whiskey and “bourbon-style” whiskey (the designation “bourbon” is restricted to American distillers, albeit not just to those in Kentucky) as possibilities for the future. There may also be room to experiment with different wood aging techniques as, according to Rook, English whisky isn’t by law required to rest in oak, unlike its Scottish counterpart. The kit installed at TLDC certainly offers enough flexibility to try new things, as does the entrepreneurial spirit of the proprietor. What with all samples being cask or original strength the effects were soon apparent on the imbibers, albeit mitigated by the lemon drizzle cake provided by my French companion. Unlike the inevitable hangover, it’s going to be a long wait for the first TLDC whiskies but, I suspect, a very worthwhile one.